Pets are welcome on case by case basis! Supre Market), theatres, and boutiques. It is also only 5 minutes drive to Downtown or relative time with public transport (bus or skytrain) or on a bike. Security Deposit of half month rent in accordance with TRA. I am instructor of Argentine Tango in Vancouver, Canada. 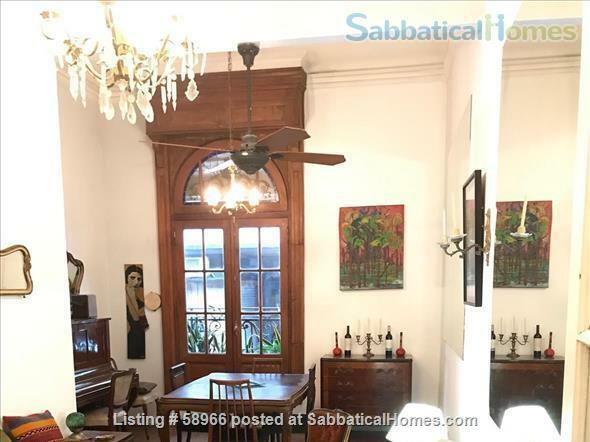 I spent a month at Nadia's fantastic place in San Telmo and it is absolutely perfect for a sabbatical visit. It is in an old stone building so it's quite and offers a wonderful atmosphere for writing. In the hot days the two small indoor patios create a breeze so it never gets too hot. The place is clean, neat and tastfully decorated. When in need for a break, the area is bustling with energy with cafes, quirky bars, restuaurants, shops, museums, parks - you name it. It's low key, people are friendly. A bit noisy on Sundays when the weekly parade takes off with drumming throughout the day. So if you're there on a Sunday, do NOT waste the day writing. Go out and enjoy the street market and the crowd! It's priceless.